It is not always easy to make learning fun, but people over at Out of the Box Games have developed a wide range of education and entertaining board games that children will love to play. Your kids will have so much fun, they won't even know they are learning and practicing crucial skills. "Games should be fun. They provide delightful diversions to our lives. Most importantly, games bring us together – for real entertainment with real people. From party to strategy games, we produce a gamut of games to please virtually any game enthusiast. Because our games are carefully designed and crafted, you can be confident that your game playing experience will always be enjoyable – right out of the box!" 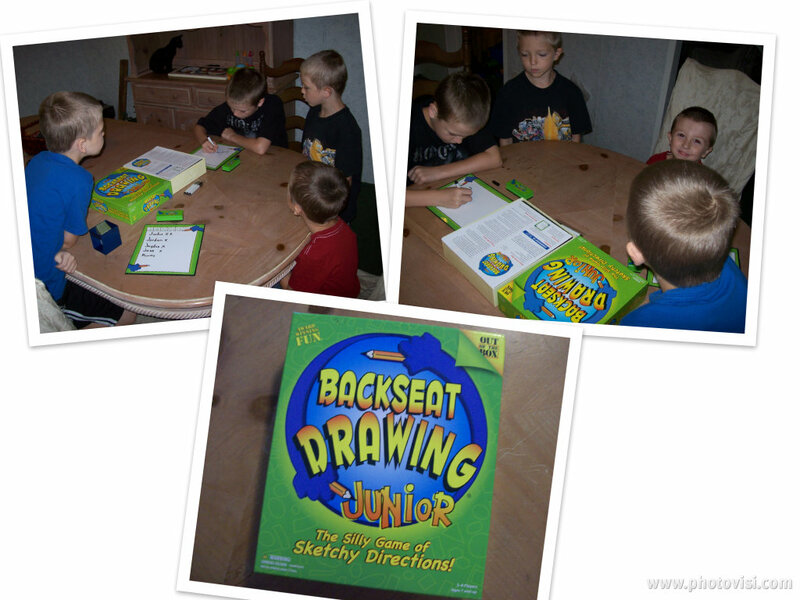 My whole family enjoyed playing the Backseat Drawing Junior game that we were able to review from Out of the Box. The game specifies that it is for ages 7 and up, but we found the even my 6 and 4 year-olds could play along in some fashion, making it fun for everyone! I love that it is educational, helps my boys work together to get things done and instills an interest in following directions. In the Backseat Drawing Junior game, you can play in teams or as one big group. One person is the drawer at a time and one person is the director who gives the drawer instructions. At the beginning of a turn, the director will pull a card from the back of the pile and place it in the front of the viewer so that only they can see it. They then proceed to give the drawer instructions on how to draw what is listed on the card. Everyone including the artist tries to guess what is being drawn and the first person to guess right along with the director that round, gets a point. You play until one person gets five points and then you can start again. There is a green side and yellow side to each card, the green side is easy and the yellow side is more advanced. Below is a video that shows some children playing the game. When my younger children play, we simply let them guess on each turn, we do not make them be the drawer or director, but even children who can't read can be directors since they can view the picture and not just a word. The product is high quality like any other board game you would purchase and comes with a ton of two-sided cards for endless hours of fun. I love how easily the dry erase boards come clean as well. The only fault I have with this game is the card viewer that was in my game is not quite wide enough to place the cards in the way they are supposed to be so we just use a few at a time and put them in at a slant. 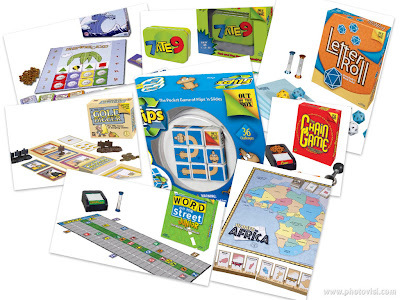 The game is a blast though and Out of the Box has a whole line of educational games that focus on letters, numbers, strategy and other important school skills. You can buy your own copy of Backseat Drawing Junior or any of the other Out of the Box titles on their website. They even have great video demos on their site so that you can see what a product is all about before you buy it! Out of the Box Publishing is offering one lucky reader a copy of Backseat Drawing Junior, a $19.99 value! 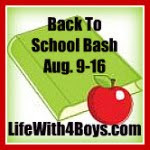 This giveaway will end on August 16, 2010 at 8pm EST and one winner will be chosen via random.org at that time. The winner will have 48 hours to respond or another winner will be chosen. Open to US residents 18+ only. In order to enter this giveaway, you must visit the Out of the Box website and comment here about a game you think your family might like. If you had signed up for extra entries earlier in the week, then be sure to leave your extra entries as separate comments on each giveaway you wish to enter. * I received an educational board game for the purpose of this review, but was not compensated in any other way. The thoughts, opinions and words expressed here are entirely my own and were not influenced by anyone else. I like the Ninja versus Ninja game. the ninja ninja game looks fun! I think 10 Days in the USA looks very fun! I like the game Rock for my family. We'd love Wat'd Ya Know Game also! We like to play card games and Run Wild looks like alot of fun! My family would like Word on the Street. I think my family would like letter roll. Shake and take looks like fun. I follow Out of the box games on twitter, nikkidavis05. I entered the Princess Linens giveaway, entry 1. I entered the Princess Linens giveaway, entry 2. I entered the Princess Linens giveaway, entry 3. I entered the Princess Linens giveaway, entry 4. I entered the Yoplait giveaway, entry 1. I entered the Yoplait giveaway, entry 2. I entered the Yoplait giveaway, entry 3. I entered the Yoplait giveaway, entry 4. Word on the Street looks good to me! The letter roll game looks fun! I think we'd enjoy 10 Days In Europe...and learn some things, perhaps?